Je remercie PP le moqueur de m'avoir indiqué ce lien, à lire absolument, avec ou sans valves... Attention au Glissen-do ! 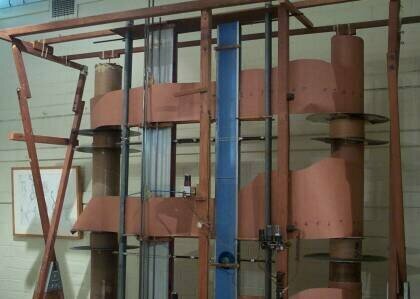 The Free Music Machines of Percy Grainger. Percy Aldridge Grainger, composer and pianist, was born in Brighton Australia in 1882 and died in White Plains NY in 1961. A highly eccentric individual with a broad range of musical and other interests, he is remembered on three continents for various aspects of his musical achievements. In Europe he is best remembered for his popular arrangements of English folk tunes such as the 'evergreen' Country Gardens . In America many people will know him as a composer and arranger of brass band music. In Australia he is remembered chiefly for his musical innovations and for what he called 'Free Music'. Despite his populist activities, Grainger was a forward thinking musician who anticipated many innovations in twentieth century music well before they became established in the work of other composers. In his early career, like Bartok, he was an active collector and documenter of folk songs, including those of the South Pacific region. As early as 1899 he was working with so-called "beatless music", using metric successions (including such sequences as 2/4, 2½/4, 3/4, 2 ½ /4, 3/8 etc) inspired by the irregular rhythmic patterns of speech. His use of chance procedures in Random Round of 1912 predates John Cage(! ), and he composed "unplayable" music onto player piano rolls while Conlon Nancarrow was still a child. Grainger first conceived his idea of Free Music as a boy of 11 or 12. It was suggested to him by the undulating movements of the sea, and by observing the waves on Albert Park Lake in Melbourne. These experiences eventually led him to conclude that the future of music lay in freeing up rhythmic procedures and in the subtle variation of pitch, producing glissando-like movement. These ideas were to remain with him throughout his life, and he spent a great deal of his time in later years developing machines to realise his conception. Clearly, Free Music is conceived of as melodic (polyphonic), making use of long, sustained tones capable of continuous changes in pitch. The term glissando does not adequately describe the movement of these tones, but may give a basic idea of the type of melodic line Grainger was referring to. A glissando is most often a performative device - it's exact shape determined in performance - and no traditional form of notation exists to adequately describe one in fine detail. Most early scores making use of glissandos describe them as a straight line between two notes of unequal pitch. Their direction of movement tends to be either up or down, much more rarely up and then down, for instance. More recent scores, especially those consisting mainly of glissandos, can be more specific. Grainger's reference to rhythm is an interesting one, since sustained tones are not usually thought of as having rhythm. It is doubtful that he was referring to articulation or simple dynamic variation. Grainger's own scores were originally notated on graph paper, with an individual trace for both the pitch and dynamic changes of each note. If a conventional rhythm were to be notated in this way, it would mean bringing the dynamics fairly often down to zero - turning off a note in order to begin the next, and so articulate a rhythmic sequence. Yet Grainger's dynamic shapes are aligned more to the phrase than the individual note. How then is a rhythmic pulse achieved? One answer lies in the pitch domain. The pitch undulations in a moving line serve to articulate rhythm by their change of direction or by a change in the rate of movement. Nothing in traditional music theory prepares us for this fundamental relationship between pitch and rhythm, which goes some way toward explaining why Free Music has remained misunderstood for so long, and perhaps why other composers have been slow to take up the challenge of Grainger's conception. Harmonically, too, Free Music questions the tenets of Western musical practice by assuming a moving tone, precluding any harmonic stability. In this context, a "stable chord" is perhaps one where all parts are moving in a fixed parallel relationship to one another. Yet by definition in Western harmony, this is a "changing chord" because the fundamental is in motion. Working with this material can be a vexatious undertaking for the composer, since almost every basic assumption about musical relationships and method is called into question. Grainger considered Free Music to be his only lasting contribution to music. Yet what remains after his death is a collection of short score fragments, a few experimental recordings, and a number of prototype machines built for the purpose of realising his ideas. Grainger resorted to the use of machines because it was apparent that human performers on traditional instruments were not capable of producing what he required. Although some traditional acoustic instruments are able to produce "gliding tones" - instruments like the trombone and violin - they do so within comparatively narrow ranges, and the necessary control over minute fluctuations of pitch is difficult to achieve. Nor were the available electronic instruments suitable for his purpose. Many of those developed before the 1950s tended to be keyboard-based and thus wedded to the chromatic scale. Others, such as the theremin, lacked a means of subtle and consistent control. While more complex instruments, such as the RCA synthesiser developed by Harry Olsen during the 1950s showed more promise, it was also apparent that Free Music worked against their inherent design principles; that it would be necessary to force them into something that they were simply not designed to do. Grainger's early experiments involved modifying existing instruments, enabling them to approximate gliding tone characteristics. The "Butterfly Piano" for example, was tuned in sixth tones so that scalar passages played on it would give a closer approximation of gliding tones than a traditionally tuned piano. Grainger was not interested in microtones since his idea meant the abolition of the scale, his goal was a controlled continuous glide, and microtones were quite literally just a "step" towards this end. A number of other experiments were carried out in collaboration with physicist Burnett Cross. Cross has described, (in a lecture given at La Trobe University in Melbourne in 1982,) connecting three electronic keyboard instruments called Solovoxes - tuned a third of a semitone apart - by means of string to a piano keyboard to achieve similar ends. This experiment, while demonstrating some feasibility, ultimately proved unsatisfactory since one of the Solovoxes invariably produced a different tone quality than the other two, and the instrument constantly played triplets! Another machine, the Oscillator-Playing Tone-Tool built in 1951  , is based on a morse code practice oscillator, called a Codemaster, which was available at the time. This oscillator had a continuously variable pitch range of some three octaves, adjusted by a control on the front panel. Grainger's sketch of November 1951 shows a hand drill mounted on a Singer sewing machine, connected in such a way that the piston of the sewing machine was able to turn the handle of the drill. The shaft of the drill was fixed onto the codemaster's pitch control. In this way, turning the wheel of the sewing machine altered the pitch of the oscillator. figure 1. The top section of the kangaroo pouch machine as it stands in the Grainger Musuem, showing the feeder rolls and paper cutouts. (photo R Linz). 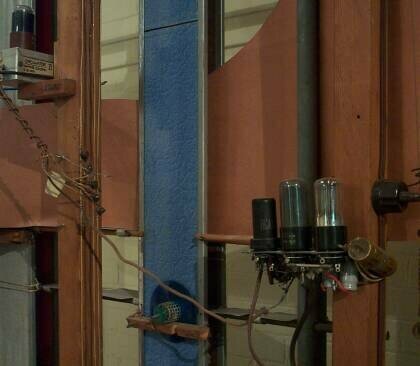 Perhaps the most famous of Grainger's Free Music machines is the so-called "Hills and Dales" machine, described in a sketch of 1952 as the "Kangaroo Pouch method of synchronising and playing eight oscillators". This machine, which is exhibited in the Grainger Museum, consists of a large wooden frame approximately eight feet tall, housing upright rotating turrets left and right (the "feeder' and "eater" turrets) and between which a large paper roll is wound. This roll consists of three layers: a main paper roll 80 inches high, across which eight smaller horizontal strips of paper (or subsidiary rolls) are attached front and back. The top edges of these subsidiary rolls are cut into curvilinear shapes ("hills and dales") and attached to the main roll at their bottom edges, each forming a type of "pouch". As the turrets are rotated clockwise, the undulating shapes cut into the rolls move from right to left. Eight valve oscillators are mounted onto the wooden frame, four at the front and four at the back, as are eight amplifiers. The pitch controls of the oscillators are attached to levers, connected at the other ends to circular runners, or spools, which "ride" moving rolls. The volume controls of the amplifiers are operated in the same way. Thus, the pitch of the oscillators, and the volume of the amplifiers, can be accurately controlled by carefully cutting shapes into the paper rolls. The final machine, uncompleted at the time of Grainger's death in 1961, was perhaps the most sophisticated. It too worked on the principle of a moving roll, but this time made of clear plastic. Here, a row of spotlights projected light beams through the plastic roll and onto an array of photocells, which in turn controlled the pitch of the oscillators. The familiar undulating shapes, so carefully cut into the paper rolls of the Kangaroo Pouch machine, could simply be painted onto the plastic roll with black ink. Moreover the circuitry for this machine was transistorised, lending a stability which could not be achieved with the use of valves. Unfortunately, the machine was lost in transit between Grainger's home in White Plains and the Grainger Museum in Melbourne during the 1970s. Nor did Grainger have the chance to compose with this machine, so we can only speculate about the music he would have created on it. This leaves us with something of an enigma. Although we can form a reasonably clear conception of Grainger's intentions, Free Music remains essentially an abstract, unrealised idea. Yet the implications of this idea point to nothing less than a total renovation of Western music; to far more radical concepts than Schoenberg's 12-tone method, for example. Grainger's search for a means to realise Free Music was frustrated by a lack of substantial resources and by the limitations of available technology. Despite the recent advances in electronic instrument design, the question posed by Burnett Cross still bears some careful consideration: are the means of realising Free Music available today? First published in Experimental Music Instruments vol12 #4, Nicasio CA 1997 pp 10 - 12. This version includes links and photographs that did not appear in the original. Votre blogs, a vraiment excellent à votre fidèles partisans.